Files with itp file extension might also be projects from ITEM ToolKit analysis software. What is itp file? How to open itp files? The itp file extension is also used by ITEM ToolKit program for its default project file format. ITEM ToolKit is a reliability analysis and safety software. Projects contain saved work in progress. 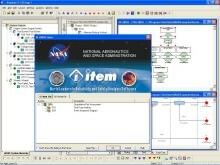 ITEM ToolKit is a suite of comprehensive prediction and analytical modules all in an integrated environment. ToolKit is an integrated environment benefiting from object-oriented architecture; delivering accuracy, flexibility and ease of use. It offers you convenient features that provide a consistent format for all your analyses. This enables learning carry-over from one module to another. You can open and continue to work with these projects in ITEM ToolKit. and possible program actions that can be done with the file: like open itp file, edit itp file, convert itp file, view itp file, play itp file etc. (if exist software for corresponding action in File-Extensions.org's database). Click on the tab below to simply browse between the application actions, to quickly get a list of recommended software, which is able to perform the specified software action, such as opening, editing or converting itp files. Programs supporting the exension itp on the main platforms Windows, Mac, Linux or mobile. Click on the link to get more information about ITEM ToolKit for open itp file action. Programs supporting the exension itp on the main platforms Windows, Mac, Linux or mobile. Click on the link to get more information about ITEM ToolKit for edit itp file action. Programs supporting the exension itp on the main platforms Windows, Mac, Linux or mobile. Click on the link to get more information about ITEM ToolKit for create itp file action.